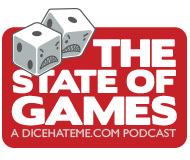 Hello, Dice Hate Me fans! It’s Josh from Board Game Reviews by Josh. With Chris’ time being invested in VivaJava at the moment, I volunteered to help keep the reviews coming! Whereas our writing styles are a bit different, hopefully I’ll provide the kind of high quality review you’ve come to expect. Without further ado, let’s take a look at The Speicherstadt. 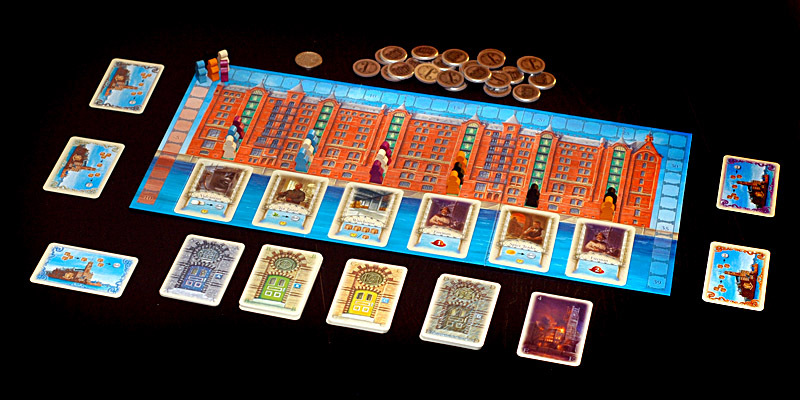 The Speicherstadt to me is a perfect example of what it means to be a “European” game. It is a very tight game about managing resources – and is, in fact, the first resource management game I have ever played that has hardly any resources. It feels a bit like playing a farming game set in the middle of a drought! So here’s what happens: each player has three bidding markers. Starting with the first player, each player places one of their bidding markers next to a “building” (by building I mean a building, contract, ship, or firemen; also, there will be one more building available than there are players in the game). If another player (or players) have already placed their marker on a building, you can place your marker above theirs. 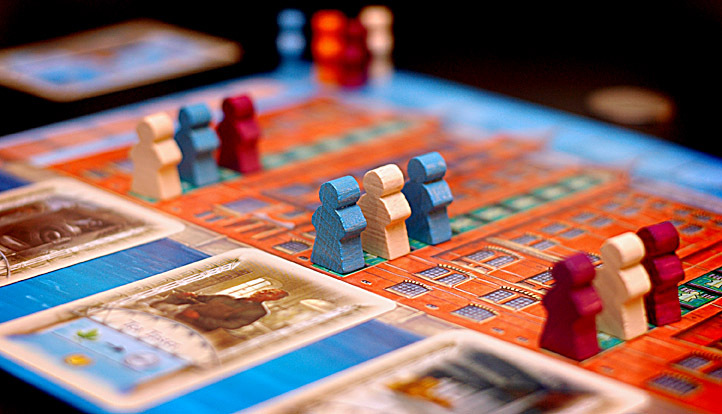 After all markers have been placed, you start determining who purchases each building – the player who placed on the building in question first has the first chance to buy it, but at a cost of $1 per marker present. If they pass, the second player has the option (and it is now $1 cheaper), and so on until the building is either purchased or all of the players have passed. After this, if someone has purchased a ship (the only way of getting resources in the game), then they have to immediately allocate their new resources – whether this means they store them in a warehouse, trade them to the bank, or place them on a contract. Now, at the end of the turn, each player collects $1 of income from the bank ($2 if they purchased no buildings that turn). Also during the course of the game, four fires will start. Each player helps put the fire out by contributing his Firemen (if he has any – these can be purchased like buildings, but must have already been purchased in order to be used). The person(s) with the most Firemen get victory points, and the player(s) with the least Firemen lose points. When you fight the last fire, the game is over, and players add up their score – points can be earned through completed contracts, buildings, and from fighting fires. Whoever has the most victory points gets the option of gloating the loudest (and dancing a victory dance – but you should at least think about having a tactful one)! The first thing that I like about The Speicherstadt is how purchasing buildings works. I think that this concept of demand is an innovative and yet simple mechanic that functions masterfully. From a capitalist perspective, it also makes sense to me – if there are three people that all want the same thing, then let the first person purchase it – but only if they’re willing to pay for it! (How much do new iPhones cost when they come out again?) Well, it’s not exactly like how supply and demand works in a real marketplace, but it is a nice mechanic in this game. The first person present gets the opportunity to buy the building, but each extra coin they spend can make a large difference in the game! (Keep in mind, you only gain one extra coin per turn) Unfortunately, the limited amount of money in the game essentially turns this into a first player disadvantage. However, you each take turns being first player, so overall, I really enjoyed this new way of handling purchasing. The next thing that I thought was interesting was the limited quantities of everything in the game. You won’t have an abundance of anything, I can almost guarantee it. One of the games I played I purposely refrained from buying any buildings for the first few turns so that I could have more money later on. Sure enough, within a few more rounds I had been able to purchase what I wanted, but I was back to a very small amount of coins available in my bank (by the way, this strategy worked; I won that game). This makes each decision feel much more crucial – which adds more of a sense of excitement and tension into a fairly simple game. With that said, the main con that I had with The Speicherstadt was that I felt like the first phase of buildings were somewhat worthless. (There are 4 different piles of buildings that are shuffled separately and stacked on top of each other to form the draw pile.) Most of these buildings allowed you to trade in extra goods of a certain type for one coin each. Yes, there are times when trading a specific good for one coin is useful – namely, when you have excess amounts of that good and no need for it. However, the trading buildings from the first phase only work with a single type of good and only improve your basic trading from a 2:1 resource to coin ratio to a 1:1 resource to coin ratio. And, you don’t know which goods you will have extras of later in the game. Therefore, buying any of the trading buildings seems to be far more of a gamble than a strategic decision, in my opinion. Since the bulk of the first phase buildings are these trading posts, most of the first phase felt somewhat pointless. My second con was that there was nothing that really grabbed me about The Speicherstadt. Yes, this is a much harder con to describe, but overall the game just didn’t engage me to the point where I felt like I needed to play it repeatedly. There was no sense of building on previous accomplishment. Yes, there was ongoing strategy from the beginning to the end of the game – buy contracts, decide whether you need buildings now or coins later, make sure that you have firemen; but, overall you’re still reacting to the situation more than you are developing a long term strategy. 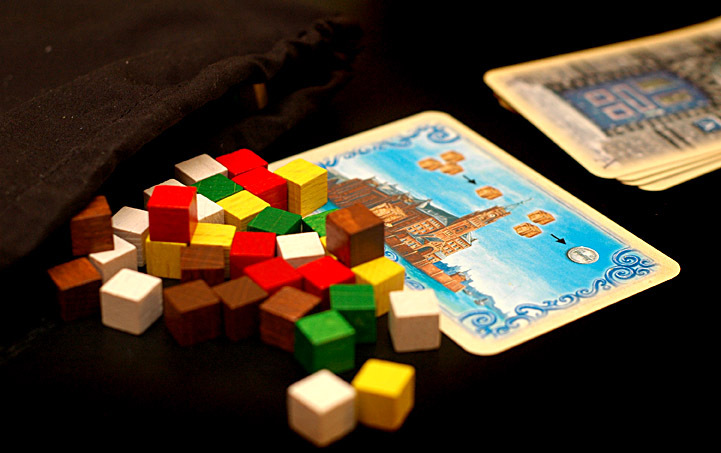 Whereas I don’t think that necessarily makes a game bad, it is my best attempt of explaining why The Speicherstadt didn’t grab my imagination and make me excited to play it again and again. Overall I give The Speicherstadt a 7.5/10. It works – there is nothing wrong with this game. I wouldn’t even mind playing it more if other people were interested. However, it’s probably not something that I will actively pursue. I am glad that I had the opportunity to try it, though, because it did feel unique to me, even with all of the other games that I have tried. The Speicherstadt offers some innovative mechanics, but isn't as engaging as I would hope, causing the long term replayability to suffer. But then again, I'm ok with wooden pieces and meeples. The expansion even replaces the cardboard coins with shiny metal ones (from what I've been told). I enjoyed playing this game. Then again, I love to play games! I hope you enjoyed your brief interruption from Chris’ writing. Can’t read enough about board games? Once you’ve read all the articles here, why not check out my site for a bit. Or better yet, why not follow us both? The Speicherstadt is a game for 2 to 5 warehouse managers, ages 8 and up, by Stefan Feld for Z-Man Games. It’s available for 30 bucks at Board Game Guy, or at your Favorite Local Game Store. I also found the bidding mechanic in this game to be excellent at producing tension. Especially when you think you’ve got a steal near the end and are just hoping no one puts their last guy behind you. My problem with the game is how it handles turn order. When bidding is sequential and money feels like it isn’t granular enough (a change from $2 to $3 is gigantic), who sits to your left and right are incredibly important factors in strategy. I don’t like my strategy being dictated by how people sit down at the table before the game even begins.